You might remember a few months back, DJ Khaled used Snapchat to broadcast his rather tense battle with the elements as he got lost at sea on his jet ski after dark. It was an unusual, dramatic and surprisingly compelling tale of self-reflection and adversity. 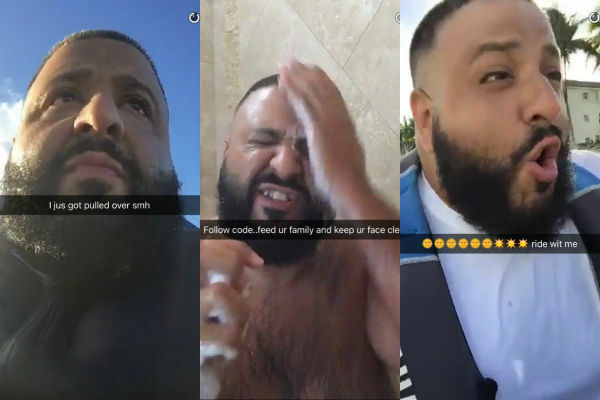 Even then, Khaled's little wisdom nuggets were prime fodder for sites like BuzzFeed and Sick Chirpse, but now he is claiming himself to be the 'King of Snapchat', and while the title is grandiose, it's not necessarily inaccurate. Khaled has around 6 million followers, which isn't the highest count on the app, Kylie Jenner tends to be considered the most followed person on there, but what sets Khaled apart is that Snapchat has actually had a pronounced effect on his career. His Snaps range from chronicling his daily exploits and standing up against 'they', which is basically the millennial iteration of 'the man'. The trends he sets on Snapchat are so popular that they're being adopted by other celebrities, even the ones with bigger fanbases than Khaled. On Thursday, ABC spoke to him on the Nightline segment of their news program, and asked him what he owes him Snapchat stardom to. He attributes it to his honesty. Often times, famous faces are encouraged to pull a facade over themselves before stepping out into the spotlight, but Khaled maintains that everything you see on his Snapchat is 100% him, no gimmicks. When he encounters his fans, he's neither flanked by bodyguards nor cocooned in a limousine, he's just out in the world. People appreciate transparency, more so among the rich and famous than anyone else. It can be easy to forget that they're people too, but Khaled is clearly keen to keep that consideration at the front and centre. Sure, he's loaded, lives in a gigantic house and has produced a string of hit songs, but if his Snapchat is to be believed, he doesn't see himself as better than anyone else. It's cheesy, sure, but since around 50% of his hulking fanbase are newcomers, it works a treat. The thing about Snapchat in paricular, more than any other social network, is that it puts everyone on the same level. Whether you're DJ Khaled or Daryl from Coventry or Diane from accounting, it's just you, your phone, and whatever happens to be going on at the time. It's relateable by its very nature and popularity seems to depend on capitalising on that. Khaled has gotten that down to a fine art. Just know.